To buy any item displayed on our site please telephone us on 07973 782 893 or email cards@cthompson.org.uk with your requirements and we will confirm availability and any shipping/postage charges. 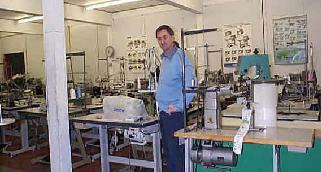 Purpose built premises near to A1 in Gateshead house over 400 used industrial sewing machines. Due to the nature of our products it is important for the customer to ensure the suitability of the item in question for their specific tasks and circumstances. We want you to be happy with your purchase! When you email please let us have your full address, including country, electric power supply voltage, and any other relevant details. Sometimes we will ask for samples of the work that the customer wishes to achieve with our product for testing. Agents for industrial sewing machinery by Brother, Juki, Pegasus, Seiko, Kansai Special, Siruba, Union Special, Treasure, Lewis, Bernina and Maier. Agents for Eastman, Cutex, Hitaka, KM, Miniroller and True-Cut Cutting Knives and cloth spreading equipment. Agents for Stirovap, Camptel and Casoli Steam Pressing & Ironing Equipment. Agents for Bandwise Reliant & Hashima Fusing & Heat Transfer Press Equipment. Tajima Embroidery Machinery agents for England, Scotland and Wales. Other embroidery machines sold, Toyota, Brother, Barudan, SWF. Marathon Embroidery Thread for commercial and home use machines. Bag Closing and other machinery by Siruba. Adler, Durkopp, Mauser and Pfaff. Machinery & Parts for all types of machinery despatched to anywhere in the world. Home overlockers by Necchi and Baby Lock at Online Shop. FastPress electric press for home use and Blanca press for commercial use. If you have any assembly or finishing problem just send us a sample and we'll be happy to advise on a solution. We can engineer existing machinery or create new ones. By sending us samples we will be able to supply the right machinery stitched off or set up for your particular job. We won't send any piece of equipment we don't believe right for a particular job.